Liam Neeson returns to his successful action franchise with 2015’s Taken 3. Former covert operative Bryan Mills (Neeson) seems to near reconciliation with his ex-wife Lenore (Famke Janssen). However, this gets cut short when unknown parties murder her. To make matters worse, Mills finds himself framed for this slaying. Skilled in various forms of combat and violence, Mills throws himself into attempts to find the killers. Inspector Frank Dotzler (Forest Whitaker) pursues Mills as our hero looks for justice. The original Taken helped redefine Neeson as an actor. Prior to that flick’s early 2009 release, he’d not done a lot of action, but now he’s enjoyed a second career as a super tough guy. Whatever goals the first – or even second - films desired, by Movie 3, I think audiences seek one thing alone: Neeson in badass mode. The longer the franchise runs, the more transparent this rationale becomes. The original flick enjoyed an organic reason to exist as a story, but the sequels have needed to work harder to justify their existence. Though Mills’ background at least allows the franchise to avoid a certain lack of believability. Had our lead not been a special agent, it’d make less sense that he finds himself in more violent adventures, but Mills’ history lets the series involve him in different shenanigans. Heck, even the continued threats to his family make sense, as those who wish to harm him would use his kin against him. That said, I think storylines seem less and less important as the franchise progresses. We needed a good narrative to launch the series but three films in, these elements tend to fall by the wayside. In fact, plot material feels like an encumbrance here. Taken 3 tries to provide character intrigue but ultimately seems a lot like a semi-remake of 1993’s The Fugitive. I do admire the filmmakers’ refusal to simply redo the original film’s story again and again, but that doesn’t make the “unjustly accused man on the run from the law” tale any fresher. The only thing that keeps Taken 3 from total Fugitive territory stems from Mills’ skills, and that allows the movie to boast more of an action bent. While Fugitive certainly came with plenty of thrills and excitement, Richard Kimble wasn’t exactly a tough hero sort; he was more of the ordinary man in the Hitchcock mode. That differs from Mills, of course, as Taken 3’s hero can handle the baddies thrown at him. The film’s only potential fun comes from those moments, as the story itself goes nowhere. I should probably applaud the movie’s attempts at character depth but they flop, especially since the subplots feel so contrived and predictable. Taken 3 telegraphs its points and leaves us bored as we wait for the action. Unfortunately, Taken 3 leaves us adrift too much of the time, as it concentrates so much on those boring story bits that we lose interest. When we find action, the movie sort of pops to life, but it submerges us in so many sludgy narrative elements – Kim, Lenore, whatever – that we just don’t care and we become impatient to get to some excitement. The movie’s editing doesn’t help. I know action flicks tend to go with rapid cutting, but Taken 3 turns silly in that regard. Heck, even a scene in which Mills descends a staircase apparently requires an edit every second or less! The filmmakers bludgeon us with their impatient cutting and make the movie’s pacing an annoyance. 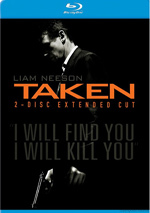 I liked the first Taken, and although I felt less enamored of Taken 2, I thought it delivered some moderate entertainment. Taken 3 can’t even live up to that level, as it turns into a slow, dull movie without any inspiration. Taken 3 appears in an aspect ratio of approximately 2.39:1 on this Blu-ray Disc. This was a mostly appealing presentation. Sharpness became the only inconsistent element, as a handful of shots came across as a bit soft. These remained in the minority, though, so the majority of the flick displayed concise, distinctive elements. I saw no jaggies or shimmering, and edge haloes failed to mar the image. Print flaws also didn’t appear. Here’s a shocker: Taken 3 opted for a palette with an obvious teal and orange push! Especially teal, as it happened, along with some yellow as well. I’m tired of these stylistic choices, but within the image’s parameters, they looked solid. Blacks showed good depth and darkness, while low-light shots appeared smooth and clear. The occasional soft moment made this a “B”, but the picture worked well most of the time. I also felt happy with the solid DTS-HD MA 5.1 soundtrack of Taken 3. Despite the movie’s billing as an action movie, it didn’t come with a ton of auditory theatrics. A few violent scenes kicked into higher gear, too, but much of the film stayed fairly atmospheric. That was fine, as we got good stereo music and a nice sense of place. The various elements combined in a compelling manner to form a strong soundscape. A few extras fill out the set, and we find two separate editions of Taken 3. The disc includes the film’s theatrical version (1:48:57) as well as an unrated cut (1:55:18). Because the Blu-ray represented my initial viewing of the film, I can’t cite the differences, but I wanted to mention the presence of the two cuts. Called “Flashback Malankov”, one deleted scene lasts seven minutes, 16 seconds. It shows us more of the movie’s main villain, It seems moderately interesting, though it’s not clear how the sequence would’ve fit the final product; it doesn’t feel like it’d mesh with the rest of the movie. For a look at the film’s gadgets, we go to a collection of snippets under Sam’s Bunker AKA ‘The Rabbit Hole’. In this three-minute, one-second reel, we learn about the technology used by Mills. It’s mildly informative at best. Two featurettes follow. Taken to LA lasts four minutes, 16 seconds and involves director Olivier Megaton and actors Liam Neeson and Maggie Grace. The show looks at locations and related production issues. A few decent notes emerge but the program lacks much depth. A Taken Legacy takes up four minutes, 54 seconds with Neeson, Megaton, Grace, and actors Forest Whitaker and Leland Orser. This piece discusses the various films in the franchise as well as aspects of Taken 3. It’s another minor featurette without a lot of merit. Next we get a Gallery. Ir shows 12 shots from the production and offers little of interest. The disc opens with ads for Spy, The Marine 4: Moving Target and Kingsman: The Secret Service. Sneak Peek adds promos for the Taken franchise, Sons of Anarchy Season 7, Unfinished Business and Homeland Season 4. We also find the trailer for Taken 3. Saddled by a rehashed plot and a lack of inspiration, Taken 3 never manages to involve the viewer. It feels like product that exists to propagate the franchise more than something that exists because it has a good tale to tell. The Blu-ray provides mostly positive picture and audio along with some minor supplements. The longer the series goes, the worse it gets, and Taken 3 becomes the weakest release yet.